I’m happy to have developed today’s recipe for Chili con Queso Dip as part of my parternship with Horizon Organic. I love cooking with their naturally good products and I feel great about feeding them to my active kids. 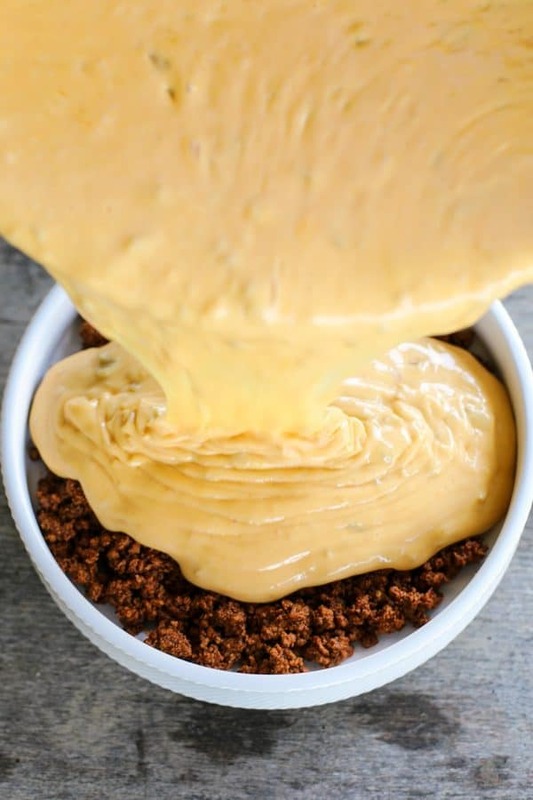 Nothing, but nothing beats a giant bowl of Chili con Queso Dip. Why? Well, you’re basically talking about a bowl of your favourite chili topped with melty, ooey-gooey, chile studded cheese dip or queso. 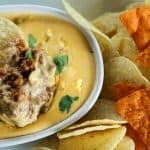 There aren’t many foods that my five boys and husband will demolish quite like Chili con Queso Dip surrounded by tortilla chips. How it is that chili con queso came to have such an air of mystery surrounding it is beyond me. It’s one of the easiest and most fuss-free hot dips you can make. Heat up your favourite chili and spread it in a bowl. Melt some butter in a pan and sweat some onions, spices, and diced green chiles, whisk in some flour and toast then whisk in milk and bubble ’til thick. Stir in scandalous amounts of cheese until melted completely, then pour that glorious golden cheese over the chili and grab a bag of your best-loved tortilla chips. TADA! I know many queso recipes start with a box of shelf-stable cheese product, but I’m always a little weirded out by a form of cheese that can safely sit on the shelf for years. 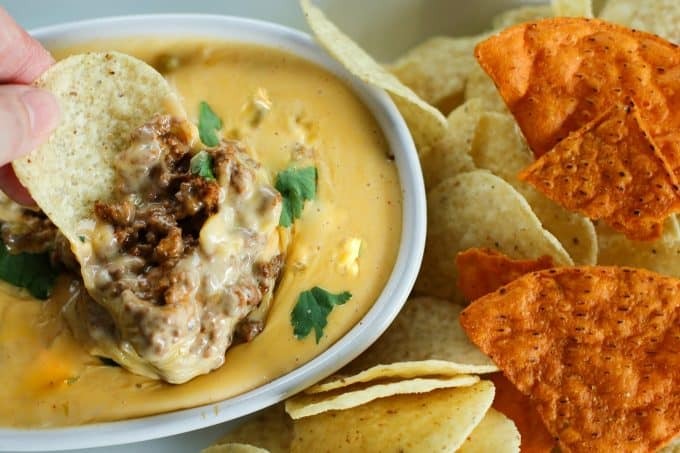 The truth is, though, that for queso to get that super smooth melted texture we all love, it needs a supremely meltable cheese like that shelf-stable cheese or American cheese. I feel a lot better about fresh cheese made from honest ingredients without crazy preservatives. 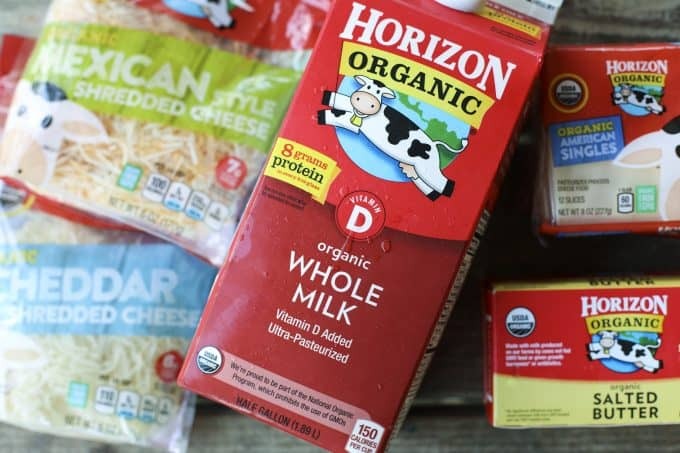 I’m VERY excited to have discovered that Horizon Organic makes an American Cheese with the simplest of ingredients: Cultured organic pasteurized milk, organic nonfat milk, organic milkfat, sodium citrate, salt, organic annatto (vegetable colouring), microbial enzymes (non-animal, rennetless.) And wonder of wonders, it melts every bit as smoothly as the other stuff and tastes far better. But the cheesy goodness doesn’t end there; I like to add Cheddar and a shredded Mexican Blend to the party, too. This adds a little burst of the classic Cheddar flavour along with some excellent Tex Mex cheesy flair. ALL THE CHEESE is basically what I’m looking for here. You can use whichever chili you love best as the base. We prefer this chili, but have also used leftover taco meat in a pinch! If you can’t lay your hands on a shredded Mexican blend, you can substitute shredded Monterey Jack. 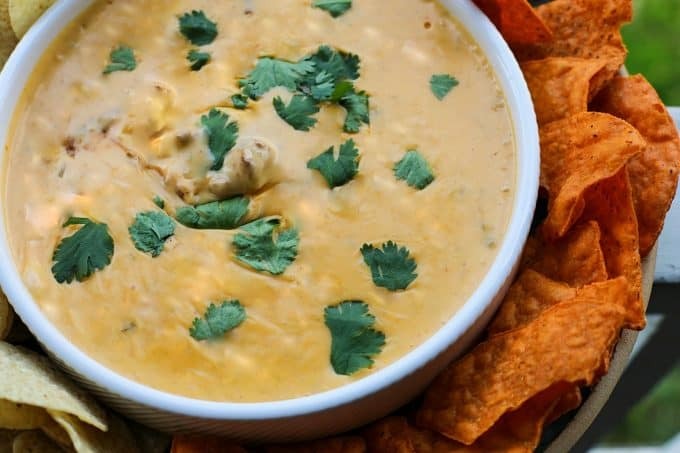 It melts like a dream and give that lovely gooey quality to your queso dip. I highly recommend using Horizon Organic’s Butter, American Cheese, Shredded Cheddar Cheese, and Shredded Mexican Blend Cheese. This recipe was tested using all of those and works for me every single time. Use whichever canned diced green chiles you like best for the queso. If you can’t find it on your grocery shelves, you can substitute a fresh jalapeno, seeded and minced. It will be slightly spicier but still delicious. Cilantro is optional, but delicious as a garnish. I love, love, LOVE sweet potato tortilla chips as an accompaniment to Chili Con Queso Dip, but if you can’t find them or they aren’t your thing, regular white, yellow corn, or multigrain tortilla chips are lovely. And if you want an extra special treat, serve with soft pretzels or thick sourdough pretzels. If you’re going ALL out, scoop some of your chili con queso over a plate full of crispy French fries. Please show our sponsor, Horizon Organic, some love for their lovely products. You can sign up for their newsletter or connect with them in the following ways. You can use these tools to make Chili Con Queso more easily! Spread the reheated chili evenly over the bottom of a serving bowl with a capacity of at least 8 cups. Place in a microwave or warm oven to keep hot. Melt the butter over medium heat in a stainless steel everyday pan or 12-inch skillet. Add the minced onions and stir to coat the onions with butter. Saute until the onions are fragrant and translucent at the edges. Stir in the diced green chiles and raise the heat to high. Cook, stirring constantly, for 1 minute. Sprinkle the chili powder and cumin over the top and stir for 30 seconds. Scatter the flour over the mixture and whisk to evenly distribute everything. Drop the heat to medium high. Cook for 2 minutes, stirring constantly. Slowly whisk the milk into the onions and chiles until smooth. Let the sauce come to a simmer, whisking slowly but constantly, letting it bubble and become thick, about 3 minutes. Add the sliced American cheese strips, shredded Cheddar, and shredded Monterey Jack or Mexican blend all at once. Stir gently until the cheese is completely melted and has formed a smooth queso. Pour over the warmed chili. Serve hot, garnished with cilantro leaves if you'd like, accompanied by copious amounts of tortilla chips and sturdy vegetables for dipping. 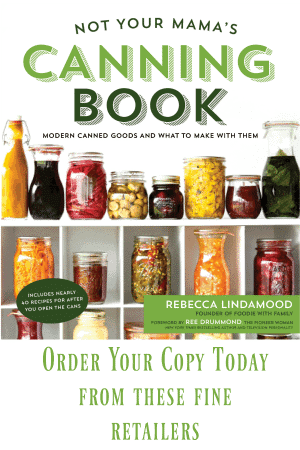 Want more delicious cheese dishes? Try these! 20 Minute Broccoli Cheese Soup, Breakfast Grilled Cheese, Grilled Cheese Hot Dogs, Homemade Garlic Cheese Breadsticks, Fromage Fort, Cheeseburger Salad, and Smashed Sweet Potatoes with Bacon and Bleu Cheese. Yummm, always looking for a new queso recipe to add to the cheese arsenal! You can never have too many quesos, right? 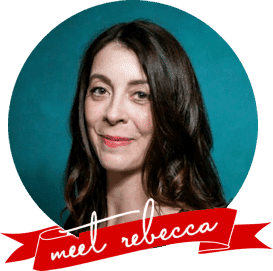 That looks great, Rebecca! chili con queso is a guilty pleasure of mine. Thanks, Chris! It’s so darned good!! As with all things, it depends on how hungry your eaters are. 🙂 Two of my teenaged boys could polish this off without hesitation during a football game, but I’d be happy putting this out as part of a bigger spread and counting on 8 people eating from it.